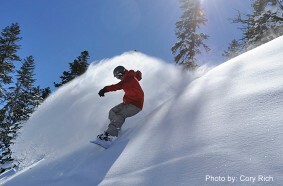 Northstar Ski Resort is a first class year-round mountain paradise located in beautiful North Lake Tahoe. With endless opportunities to enjoy some of the finest powder on the planet, a dining venue at an elevation of 8,610 feet, and so much more. A vacation at Northstar at Tahoe should be at the top of your list. A bonus is its convenient location on Highway 267, only six miles north of Lake Tahoe and six miles south of downtown Truckee. During the winter, visitors can ski Northstar’s more than 3,000 acres filled with 93 ski trails. The trails are accessed by 20 lifts, including two gondolas, making for an uphill capacity of 34,799 skiers per hour. The longest run is 1.4 miles of twists and turns that will get your adrenaline pumping, while families can take advantage of the snow tubing hill with its own lift. Northstar also features seven award-winning terrain parks designed by Snow Park Technologies (SPT) and the Northstar Terrain Park Crew. Those interested in cross-country skiing, Telemark skiing, or snowshoeing will delight in the 40 kilometers of groomed trails, plus a venue with warming huts, fire pits and picnic sites with amazing views. Northstar web cams provide real-time views of conditions on the mountain, and when the weather doesn’t cooperate, the resort brings out the big guns with the largest snowmaking system in North Lake Tahoe. Summertime pleasures are also abundant. Scenic lift rides have amazing views and take you to some of the most beautiful hikes you will ever experience. Northstar is a mountain bikers dream with more than 100 miles of trails, making it one of the largest bike parks in Northern California. Northstar California golf course is a challenging 18-hole, par 72 course designed for both men and women. The Northstar Property Owners Association Tennis Center has world class tennis facility with 10 courts available for homeowners and lodging guests. There are also many opportunities for geocaching, fly fishing, and horseback riding. The Village at Northstar is a hub for all the activity on the mountain. It is host to more than 35 shops and restaurants to suit any taste, from equipment rentals and children’s boutiques to designer shoes and fine art galleries. The paint-your-own-pottery studio, candle making shop, and bead design studios offer social activities and creative learning experiences for all ages. The Village also has a conference center, movie theaters, luxury lodging options, and special events. Other activities include a 9,000 square foot skating rink, the Apex bungy trampoline, Apex ropes challenge, and a swimming and racquet club. With so much to do, Northstar resort can turn your vacation into an amazing adventure, leaving you with memories that will last a lifetime. Discover other great Lake Tahoe ski resorts to just waiting for you to conquer. The Lake Tahoe ski resorts map offers you a complete list of resorts and their locations. Season: Open from mid-November through mid-April, weather and conditions permitting. Hours of Operations (PST): Lift operation: Daily 8:30 a.m. – 4:00 p.m. The Backside & Lookout Mtn. Express: Daily 9:00 a.m. – 3:45 p.m. Gondola Express: Daily 8:30 a.m. – 5:00 p.m. Ticket offices: Daily 8:00 a.m. Ski & Snowboard Rental Shop: Sun – Thurs 8:00 a.m. – 5:00 p.m. Fri, Sat, Peak Season: 7:30 a.m. – 5:30 p.m.